Claremont City Manager Ryan McNutt and Police Chief Mark Chase will attend a community event Tuesday night aimed at responding to the alleged race-based attack of a young biracial boy in town, McNutt said. 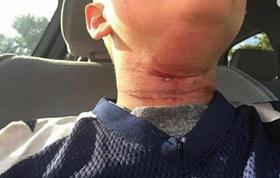 News broke last week that a group of teenagers allegedly threw sticks and rocks at the boy before tying a rope around his neck and pushed him off a picnic table. His mother posted a photo to Facebook showing cuts and bruises on his neck, writing that he was flown to the hospital but survived. Since then, many across the state have called for more information from law enforcement and an aggressive community response. Local residents are organizing a public event Tuesday at a city park downtown. City and faith leaders will speak, and organizer Rebecca MacKenzie said she hopes people come together to combat racism in Claremont in the future. Social and racial justice advocates from across western New Hampshire are expected to attend. Few details have been released about the alleged attack and police investigation. Because the incident involves juveniles, officials are limited in what information they're able to discuss, McNutt said. Copyright 2017 New Hampshire Public Radio. To see more, visit New Hampshire Public Radio. The small white sign outside the library in Williamsburg, Massachusetts, usually just lists the library's hours. That changed after the white nationalist rally earlier this month in Charlottesville, Virginia. The city of Boston is preparing for what is being called a free speech rally Saturday afternoon on the historic Common. Thousands of counter-protesters are also expected to show up, including some from western Massachusets. Holyoke resident Rick Purcell and friend will be among a group that will meet in Northampton at 5:30 a.m. to carpool and then caravan to the Boston. Purcell said he is going to the counter-demonstration because he wants to stand up to white supremacy. He said speaking out is in his legacy.